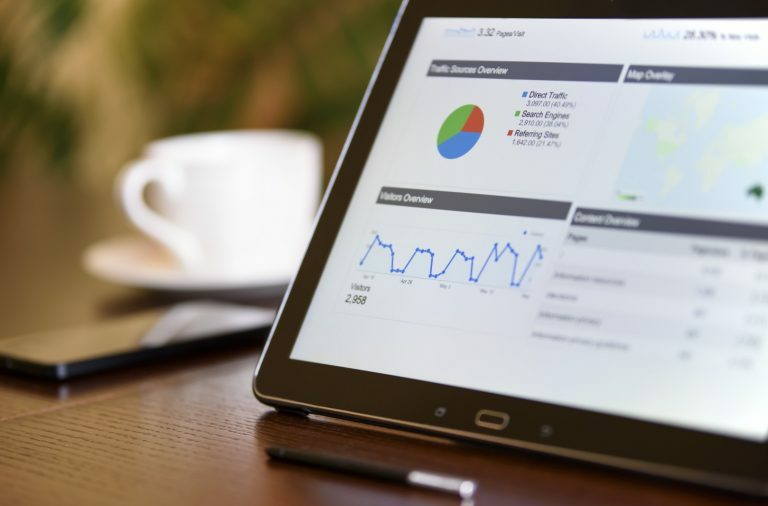 Since the mid 1990s, researchers at Cardiff Business School have enjoyed a long-term relationship with Tesco supporting its drive to lean out its supply chain and drive new levels of performance. 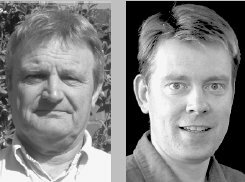 Cardiff Business School’s senior research associate Barry Evans and senior lecturer Robert Mason explain Tesco’s ability to continually unlock value from its supply chain operations. By many yardsticks Tesco, the current number three retailer in the world, represents a beacon of business excellence. Its rise over the last two decades from “also ran” to forecasted to be soon number two retailer globally (a similar rise to the one Toyota achieved in the automotive sector between 1950 and early 2000s) bears testament to this. 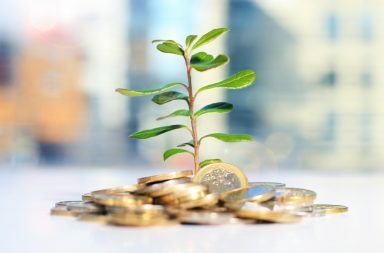 Over the last twenty years, sales, profits, earnings per share and share dividend have shown inexorable year on year growth. This unerringly consistent and impressive result record is substantially built upon Tesco’s ability to continually unlock value from its “boiler room” – its supply chain – perhaps better termed as its value streams. 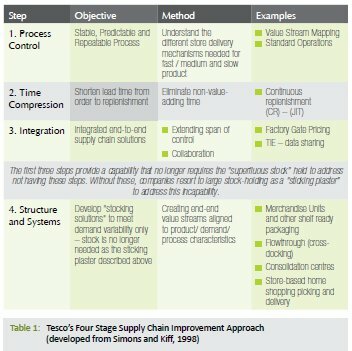 This article explores some of the underlying features of this approach and presents a range of examples which illustrate, in our view, how Tesco has executed its lean supply chain strategy. Three features arguably stand out in Tesco’s approach in managing its supply chain and help it to differentiate itself from its competitors; they are analysed here. Former Tesco CEO, Sir Terry Leahy, who stepped down in the spring of last year after leading Tesco through much of the period Cardiff Business School worked with it, argued passionately that “Tesco’s secret was its capability to listen carefully to the customers, and give them what they want”. Although arguably Tesco has taken “listening” to a new level, through for instance its loyalty card information, focus group research and so on, it is the second element of this statement – “give them what they want” – that Tesco prides itself in most and arguably sets it apart. Having accurate antennae to understand comprehensively how the customer perceives Tesco is only part of the equation. The supply chain is the key – properly controlled and executed, it ensures its goods are consistently available for a minimum price. This is a core element of the company’s premium mission. The definition of the supply chain is also scoped further downstream than for many of its competitors – instead of delineating the supply chain at the shop shelf, Tesco conceives it as embracing the full customer consumption experience (again a considerable source of differentiating potential which the company has looked to exploit). Whilst the customer is at the heart of the “Tesco Way”, the foundation of Tesco’s supply chain success lies in its Corporate Framework. This is a set of company statements and beliefs which articulate what Tesco as an enterprise stands for, delimiting its ambition and defining its values (providing a practical illustration of Collis and Ruckstadt’s “Hierarchy of Company Statements”, HBR 2008). Remarkably, all the constituent elements of the Corporate Framework (its statements of ambition, principles and its goals, supported by Tesco’s “Steering Wheel” – its interpretation of Kaplan and Norton’s Balanced Scorecard – HBR, 1996 have stood the test of time. Within this Corporate Framework, the Operating Plan sets out what Tesco aims to achieve over, say, the ensuing two-three year period, changing periodically while the surrounding plan remains constant. 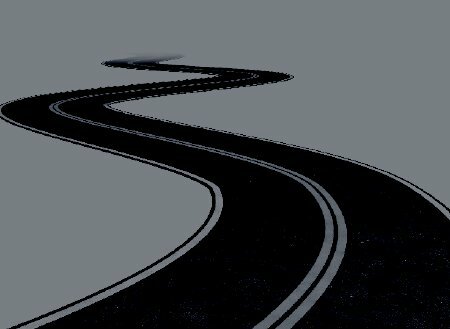 If new initiatives do not satisfy these three principles, they do not happen. This means that the pursuit of efficiency alone does not become an obsession. Ensuring customers are satisfied is critical. Tesco thinks effectiveness, not efficiency. 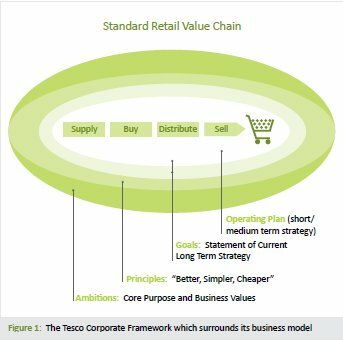 So Tesco’s management of their standard retail supply chain should be conceived within this overarching Corporate Framework which guides all decision making (Figure 1). The capability to deliver continual improvements in value is only possible due to the strength and resilience of this Corporate Framework. The third feature is the core platform of Tesco’s capability to physically differentiate itself against its competitors – how it strives to optimise its supply chain process systems. Figure 2 shows how a holistic view is taken on supply chain costs – critically the costs of “failure” are included because this is ultimately what customers pay. The discussion on Tesco’s supply chain management approach is structured around a four stage roadmap. The improvement stages are shown sequentially, but in practice are implemented through constant iterations. Total control of the processes in the supply chain is a vital pre-requisite for any organisation aiming to compete through its supply chain prowess. 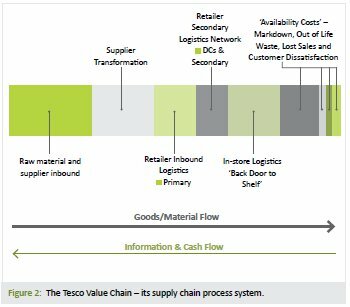 For Tesco, this fundamentally began through the 1990s when extensive steps were put in place to understand value streams, standardise operations and ensure each step of the supply chain was achieving what it was designed to do. Part of this activity was the ability to be sensitive to the fact that different products needed different store delivery mechanisms, so standardisation was achieved in a segmented manner rather than a blanket approach across the entire product range. A sign that Tesco was getting there more quickly than some of its competitors was its ability to hit the high product availability levels it had set itself both in stores and in its distribution centres. 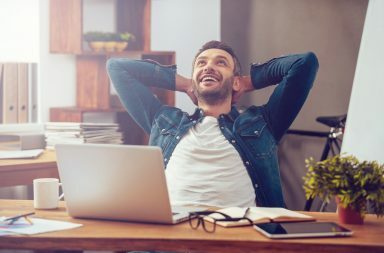 Conventional thinking would suggest that striving for 100% product availability did not make commercial sense as the law of diminishing returns would imply that the achievement of extra availability over a certain point would be too costly to be worthwhile. Yet Tesco thought and acted differently knowing that 100% availability meant the customer was never dissatisfied and the supply chain was never distorted by switch buying or lost sales on any of its products. The result that emerged was a stability that enabled supply chain managers to move to the next stage of the improvement approach. Once control was gained time could be removed from the supply chain. Tesco embarked on a major programme to shorten lead times in the supply chain around a decade ago in a move it named Continuous Replenishment (CR). The principal feature of the CR system was that it used till data to drive replenishment store deliveries, which increased at the time from once to twice a day with lead time being simultaneously reduced to twelve hours. This development substantially contributed to the drive of getting continuous flow of goods driven by customer demand through the supply chain. 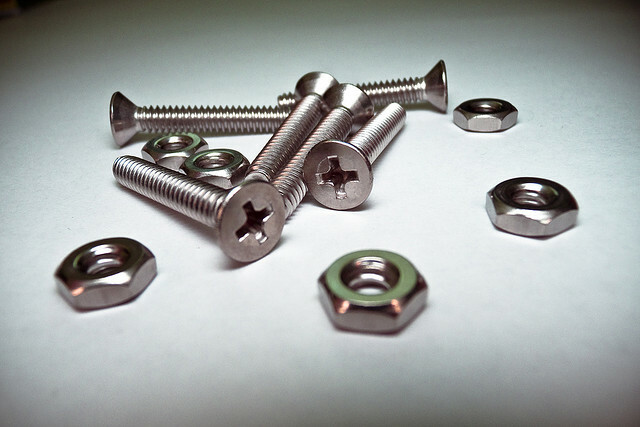 The result was that batch size was reduced and more frequent smaller deliveries became the norm having a direct bearing on inventory holding and costs. It also led to even greater levels of availability. The phased introduction of time compression with the aim of moving to true flow replenishment put considerable pressure on the physical operation and had a substantial impact on suppliers and freight transport. What was required was an integration of operations along the supply chain. For suppliers of Tesco the average batch size decreased while orders simultaneously became more frequent. Moreover, the requirements in terms of delivery of orders in full and on time to distribution and stores where stock cover was lower became more demanding. One of the major challenges was how to drive these supply chain improvements through the system with no additional costs, especially on transport. Many suppliers began introducing consolidation centres sometimes working together in ad hoc arrangements. It was at this juncture that Tesco embarked on a major integration initiative which became known as Factory Gate Pricing in 2001. In short FGP changed the way Tesco purchased products. Rather than its suppliers being responsible for delivery to Tesco’s distribution centres, Tesco bought products at “ex factory” prices and assumed responsibility for in-bound distribution to its network itself. It was then able to better optimise this in-bound network than had been the case before establishing its own consolidation centre network and synergising inbound and outbound flows producing vast savings. Integration of the supply chain was not just achieved through the extension of ownership but also involved collaboration. 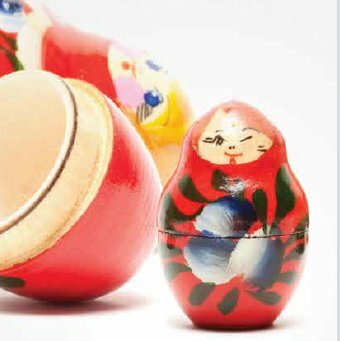 For example, the collaborative management with suppliers of products with more unpredictable demand patterns, such as new, seasonal or promotional lines, was pursued in a highly detailed manner. Data on Tesco sales were made available for suppliers through Tesco’s Information Exchange. Suppliers who had proven their ability to meet the exacting delivery demands helped in developing trials to further remove waste from the supply chain. For example, the “one-touch” initiative involved the development of a movable shelf to transfer goods from factory to sales floor removing separate handling throughout the supply chain; 15% of volume was now shipped through the supply chain on dollies. In essence inventory in the supply chain could now be viewed differently. 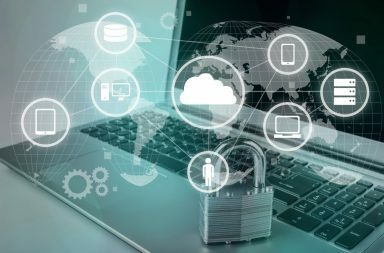 No longer was it used in a superfluous manner covering up the problems of a chaotic and uncontrolled supply chain process. Instead, inventory was minimised and stock turns increased. From this basis new structures, such as a revised consolidation and distribution centre network and systems were developed such as “One-Touch”, FGP and TIE already alluded to, concepts which would have not worked in previous lessstable supply chain incarnations. A further example of this holistic concept of thinking and capability was the pursuit of the shelf-ready packaging concept. Where the seamless flow of goods was falling down was still at the store in replenishing the shelf. Ranges of goods were developed with suppliers with packages which were ready to be moved straight to the sales shelf. 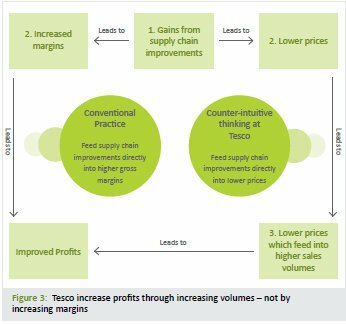 Finally, in concluding this brief discussion of the optimisation of Tesco’s supply chain a comment on the iterative nature of this procedure needs to be made. Once control was established destocking solutions could follow and the basic concept could be extended further upstream and downstream and between streams and across the ever-widening catalogue range. Thus the FGP and consolidation network concept was extended to European and more global supply chains, the grocery home shopping and Tesco Direct models were developed, and synergies between store based and internet based distribution channels pursued in an on-going, but seemingly never-ending ambition to squeeze out more efficiencies whilst not jeopardising service levels and quality. The supply chain provides the fundamental day to day core operation for Tesco. It needs to be efficient and flexible, but above all it needs to be consistently effective. As Ackoff advocates, Tesco tries to do the right thing (effective) rather than do the wrong thing righter (efficient). Tesco’s control of its supply chain spans the logistics processes from the factory gates of its suppliers through to the supply of the product to its customers. Processes must be robust and dependable and all are constantly examined and questioned within the framework goal of continuous improvement. What Tesco has been able to do over the last twenty years is to enjoy a virtuous circle where gains from its supply chain have been fed into lower prices and better service (through excellent availability) which in turn have generated higher sales. This has been in many ways a counterintuitive endeavour: the conventional route would have been to simply use supply chain savings to boost margins and profits (Figure 3). The big question now, as the era of Tesco under the leadership of Sir Terry Leahy has come to an end and Philip Clarke has taken the helm, will be whether Tesco continues to be the beacon of excellence we have come to expect. Collis, D. J. and Ruckstadt, M. G. (2008) Can You Say What Your Strategy Is?, Harvard Business Review, April 2008.
de Bono, E.(1999) Simplicity, Penguin Books, London. Kaplan, R. S. and Norton, D. P. (1996) Using the Balanced Scorecard as a Strategic Management System, Harvard Business Review Jan/Feb 1996. Reichheld, F. (2001) The Loyalty Effect, Harvard Business School Press, Boston, USA. Simons, D. & Kiff, J.S. (1998), Control, Time, Collaboration & Structure, Logistics Research Network Conference Proceedings, CILT. Spear, S. J. (2009) Chasing the Rabbit, McGraw-Hill, New York. Womack, J. & Jones, D. (1996) Lean Thinking: Banish Waste and Create Wealth in Your Corporation, Simon & Schuster, London.